The blog of a real, live Hutterite. Last week the Manitoba Hutterite community mourned the loss of a beloved Servant of the Word. 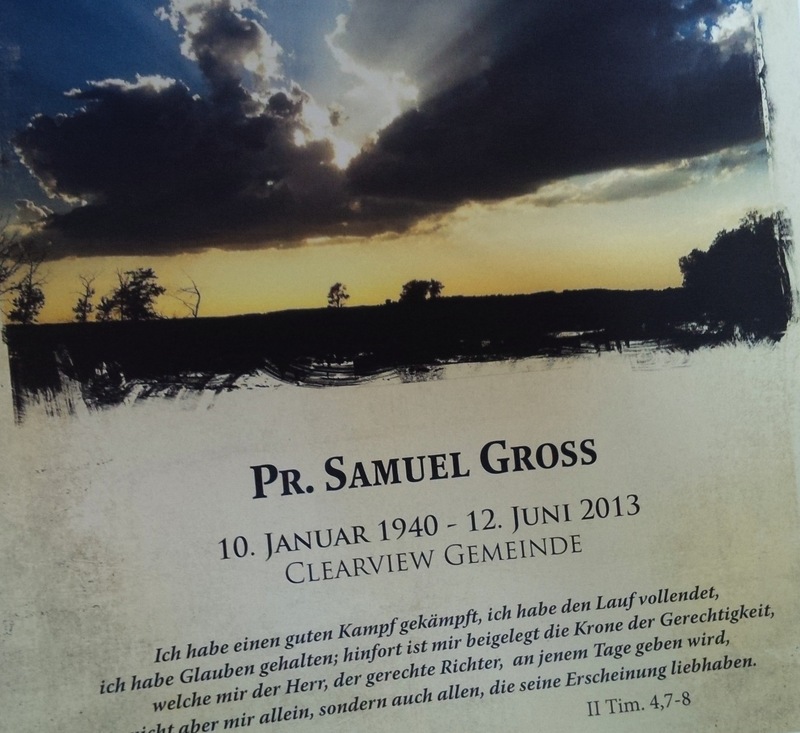 Prediger Samuel Gross passed away on June the 12th following a struggle with cancer. He served the church and his community for over 40 years as a leader and minister. Sam Vetter was widely respected for being well-read and his gift for communicating the gospel message. Typically, I don’t make enough of an effort to attend Wochtn und Leichtn, but in this case I felt particularly compelled because of familial connections and several happy memories I have of Sam Vetter. As I helped edit his obituary, I had time to recall my memories of him and think of the things he taught me. Often I have good intentions about putting these reflections in writing, but I usually procrastinate in the name of thinking about it a bit more or waiting for ‘inspiration’. This time, in the silence of the van ride ride home from the Leicht, I promised myself that I would not delay. Here are two of my favourite memories; interestingly enough, they are also my first and last encounters with him. Though I never knew Sam Vetter on a deep personal level, our paths first crossed over ten years ago in my late teens when my older brother married one of his daughters. At that point I was still a fledgling choir director making more mistakes than doing things correctly, possessing more dreams than skills or sense. I was also sporting long, floppy hair parted down the middle. What can I say, it was the 90’s. Fortunately, I had enough good sense to get it cut before the wedding. I especially appreciated Sam Vetter’s sense of humor since it often caught me off guard, because I primarily knew him as an earnest preacher. We continued to discuss other books and writers that we knew. Unfortunately, I don’t recall any more specifics, but I remember walking back to my vehicle thinking, “What a great intellect he has. We need more leaders like him, committed to learning more, especially about how to better communicate the gospel.” I remembered the Pauline explanation of gifts within the church body: some are called to be apostles or prophetic voices, some to teach or preach, and others to challenge or be Seelensorger, pastors. In my experience, Sam Vetter had a particular gift for preaching. At the Leicht, one of the officiating Prediger, Arnold Hofer, a leader well known in his own right for having the gift of frankness and sensitivity when each is respectively needed, spoke about Sam Vetter’s legacy. He gently alluded to the fact that Sam Vetter made choices that did not always make him popular among Hutterite circles or his community. He quoted the gospel writer, Luke, saying, “A prophet is not always well-loved in his own land.” He shared that in his interaction with Sam Vetter he always noticed how Christ-centered he strove to be; he listened to people who felt disenfranchised and made an effort to reach out to them. This truthful tension was very meaningful to me, because no man can do everything, but surely Sam Vetter gave his ‘utmost for his Highest’. If you have a memory to share, please feel free to leave a comment below. Categories: Reflection, Uncategorized | Tags: Hutterite, Kenny Wollmann | Permalink. Thank you Kenny for sharing this, Samvetter was loved by many. the one thing that stands out is that people from both groups all had something positive to say about him. I feel especially honored to have personally known him. We lost a great man, but take comfort in the fact that his lifestyle reflected of his love for our God, in words, actions and deeds. Rest in peace Samvetter, and may the vision of peace that you strove for, someday become reality. Rest in peace dear Servant. There truly was only one like him. And yes a true servant of God. He will be missed by many but God must have needed an angel and picked Sam vetter. REST IN PEACE, UNCLE SAM. Sam Vetter was one of Dad’s cousins. He was a great help to Netley when Chris Vetter was ill a few years ago. He also came to the aufred hulba when I got married (all the way to Maple Grove), and when my two sisters did. At Zack and Liz’s aufred, one of the men bumped his head on our ceiling fan, dislodging oodles of dirt! He calmly pulled his chair over, got on up on it, and helped mom clean up the mess.